Student blog post: On the basis of the Article ‘Port of Rotterdam Reveals Scale of Brexit Challenge’ discuss the legal issues relating to non-tariff barriers and trading standards imposed on imported goods. One of the most discussed phenomena of recent times is the decision of the United Kingdom to leave the European Union, i.e. Brexit. While the exact implications of Brexit will only become apparent once the UK officially leaves in 2019, the departure will undoubtedly have consequences on the economic relations of the UK with the EU as well as with the rest of the world. The focus of this blog post is on the effect of Brexit on trading standards, i.e. tariffs and non-tariff barriers on imported and exported goods. I will examine the challenges that UK businesses and consumers might face. Tariffs are external taxes paid on imported and exported goods as they cross the border whereas non-tariff barriers are trading requirements on goods, such as certain quality certificates which need to be shown at the border, or quantitative measures such as quotas. States usually prefer to pay tariffs to abiding by non-tariff barriers as the latter can limit or prevent a certain type of product from entering a State. One fundamental principle of international economic law is the principle of non-discrimination. It is imposed by the World Trade Organization on all its members and consists of two components: the Most Favoured Nation (MFN) treatment (Article I GATT 1994) which states that each trading partner must be treated equally and the national treatment (Article III GATT 94) which stipulates that foreign goods shall be treated in the same way as national goods. Exceptions to the principle (Article XIV) include preferential treatment towards developing nations (which goes against MFN but is for the greater good of disadvantaged nations) and being part of a regional free trade agreement. The UK, as a member state of the EU, is part of the single market and customs union, which operates as a tariff-free trade zone and applies the national treatment principle within its borders though it does discriminate against non-EU goods but is allowed to do so as it is a regional trade agreement. In light of the article by Acton (Financial Times, 28 December 2017) this blog post highlights specific issues relating to the import of agricultural goods into the UK as it is claimed that 70% of imported food comes from the EU. If the UK is unable to negotiate a free trade deal with the EU, then Brexit will result in the UK adopting the universal WTO tariffs as well as having the EU common external tariff of 2.3% being imposed on it. This may result in price rises on foods such as fruits, vegetables, and wine which cannot be produced in the UK and are primarily imported from other EU States. 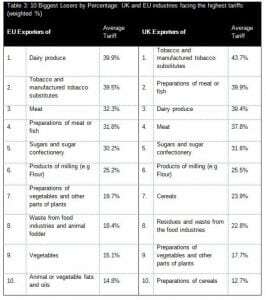 As demonstrated in the table below, tariffs on e.g. dairy produce might rise to 39.9% on EU exports and 39.4% on UK exports. The higher prices would be caused by not only higher tariffs being placed on imports from the EU but also international imports entering the EU before reaching the UK. 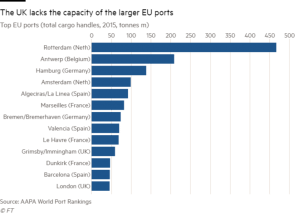 As the article explains, the latter situation is likely to happen since the UK does not have sufficiently large ports in comparison to EU ports such as Rotterdam. Source: J Protts, ‘Potential Post-Brexit Tariff Costs for EU-UK Trade’, Civitas, October 2016, available here. Goods imported from outside the EU will go through a double border control which will inevitably cause delays. This will have the greatest impact on goods which rely on the just-in-time production system, such as food manufacturers (e.g. Kellogg’s). The just-in-time inventory system relies on manufacturers producing enough to meet demand, and only storing a limited amount of excess goods in inventory. Hence quick delivery onto shelves is essential. Double border control will mean double tariffs and non-tariff barriers such as certifications. This will affect the time they reach consumers and thus create costs for businesses. As for non-tariff barriers, these will have huge implications on agricultural goods, as they are subject to stricter regulations and sanitary standards because of their public health consequences and fragile nature. Non-tariff barriers are believed to be 2-3 times the cost of tariffs on goods. With that in mind, sanitary standards and rules of origin (see Article IX GATT) of exported goods should remain strict for the UK post-Brexit. This will be to prevent the UK from acting as a ‘back door route for goods into Europe’. Since the UK will no longer be an EU member it may decide to relax trading standards, e.g. allow imports of chlorinated chicken which is banned across the EU. However, I think that the UK will nonetheless uphold most of the EU trading regulations and replicate them into its domestic law. This is because the majority of those regulations were voluntarily upheld by EU member states, as opposed to being imposed on them. In addition, as aforementioned, the UK does not possess sufficient ports for trading and so will likely continue to rely on EU ports. Source: Michael Acton ‘Port of Rotterdam Reveals Scale of Brexit Challenge’, Financial Times, 28 December 2017, available here. Regardless of the many challenges that may initially arise due to Brexit, I think the UK could possibly benefit in the long run from withdrawing from the EU as it will no longer be restrained by the EU in terms of product standards and consequently be able to negotiate free trade deals on its own terms with any State and freely decide which tariffs and trading requirements to impose. I believe the UK will learn to adapt to this new set of circumstances, but only time will tell. Previous Previous post: Student blog post: On the basis of the article ‘Can the ICC Probe End Duterte’s Deadly War on Drugs?’ (by Richard Javad Heydarian in Al Jazeera, 14 February 2018) critically discuss the legal issues relating to the involvement of the International Criminal Court in the Philippines.